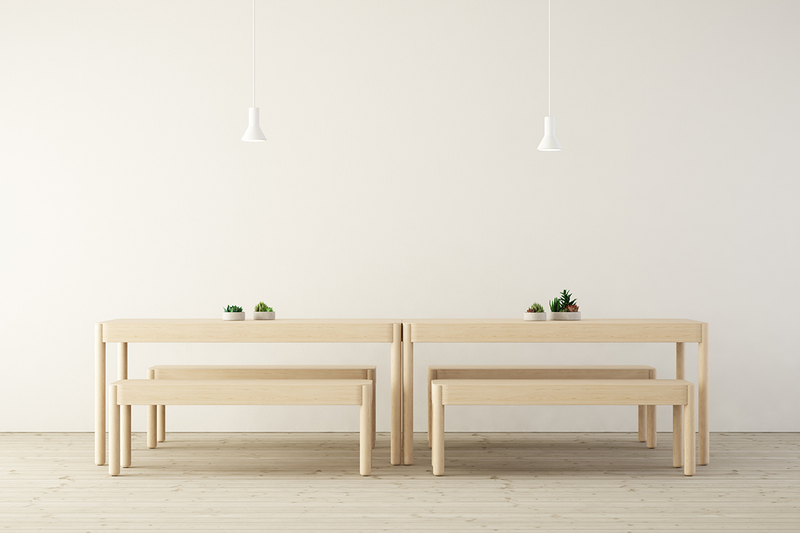 Wakufuru – a family of tables, benches and islands ‐ combining sound absorption with wooden furniture. An innovative corner design accomplished through advanced CNC‐milling, provides a system consistent family where all tables and seats are constructed the same way ‐ regardless of height or size. 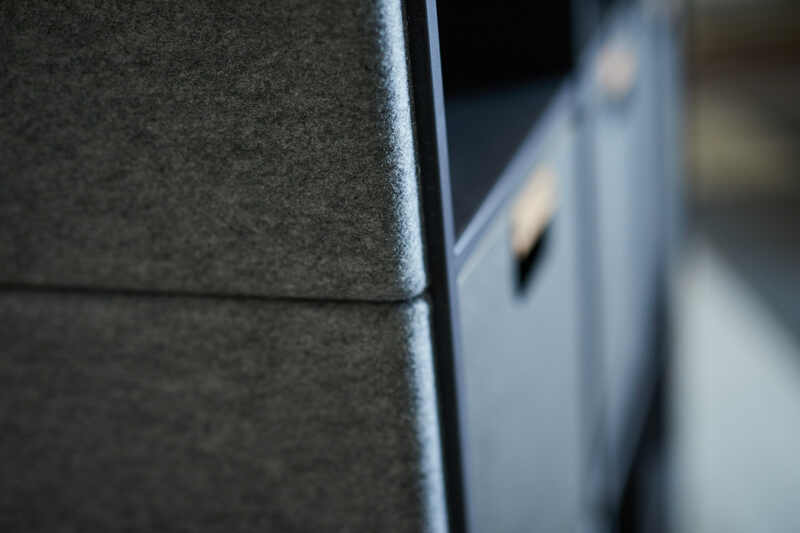 Every piece of furniture hides an effective sound absorber, built up by several interacting materials that all respond to the volume of the furniture. It all started with a curious thought ‐ can wooden furniture also be given acoustic properties? – Wood as a material, always contributes with a natural warmth in interiors. I wanted to find out if solid wooden furniture could also reflect some of the sound atmosphere that is experienced in forests, says Johan Kauppi. Already the first sketches were based on a design that focuses on Glimakras long tradition and history of production of wooden furniture. The goal was to combine this great knowledge with their contemporary expertise in acoustic solutions for public interiors. The finished furniture is the result and the essence of a process where true furniture craftsmanship, advanced wood technology and great attention to acoustics, all became key aspects throughout the design. Wakufuru is a family of wooden furniture with a friendly appeal and informal character that suits perfect for gatherings. Furthermore, there is a great added value, they effectively attenuate sound ‐ even if it is not visible. The almost homey furniture, are meant to add a sense of genuineness in interiors with demands on sound management. The solid wood and the gentle design language both offers pause and rhythm and can successfully be combined with common vertical screens or other fabric covered elements. 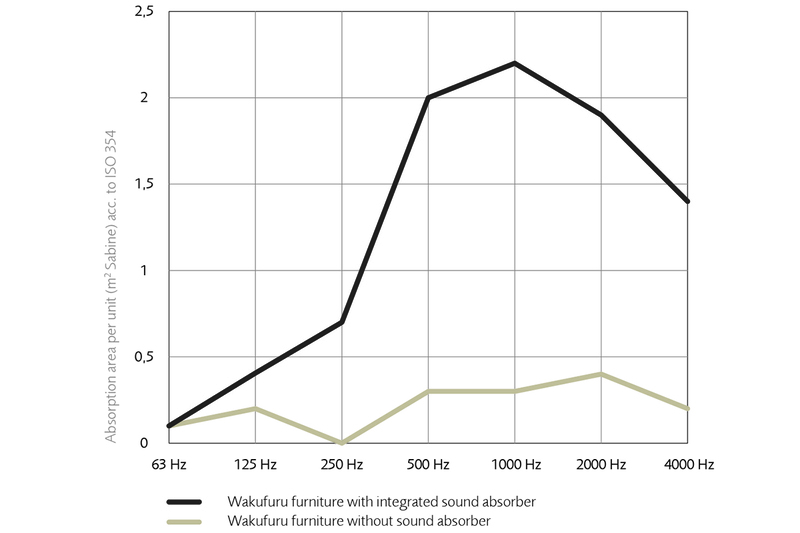 The core key is that Wakufuru offers a new tool for acoustic management in the gap between conventional acoustic solutions. – Wooden furniture is always helpful to distribute sound in order to minimize annoying reflections in rooms. However they are not always considered as good sound absorbers. Until now! Glimakra of Sweden have developed a unique furniture group not only in terms of design, but also acoustics. By using the open space under the table tops and benches an efficient hidden acoustic solution is created. The diagram shows curves representing measurement data, with and without integrated sound absorption under the furniture. The visual impression of the furniture are the same in both cases ‐ but the acoustic characteristics changes dramatically when sound absorption is integrated, says Klas Hagberg, Head of acoustics at WSP Acoustics, Sweden, engaged as acoustic expert in the project. The acoustic secret of Wakufuru is elegantly integrated in the design from underneath, this way the absorbents can effectively function without visually being seen. The open frame construction, conceals three different layers of sound absorbing materials, which all interact with an optimized air gap and the main frame volume. The result is that the Wakufuru furniture works a bit like a reversed loudspeaker ‐ where sound is absorbed instead of being amplified. All Wakufuru furniture has identical corners, legs and top structure. To achieve a harmonic furniture system with the ability to be scaled and repeated, a sophisticated CNC milled corner was developed. Frames and leg parts are all CNC‐milled out of massive ash wood. The Wakufuru furniture corners make them easy to combine and repeat in various constellations and gatherings. Wakufuru makes it easy to accomplish effective sound absorption in large areas, when using the double functional furniture in groupings of tables or arrangements of social seating. – The design of Wakufuru is very consistent. What differentiates a table from a bench ‐ is actually just the length of the legs and the size of the furniture tops, says Johan Kauppi. Read more: Product information Wakufuru. See the film: Film about Wakufuru. Download high resolution images: Hi-res images Wakufuru.